Mesoamerica, October 5th, 2017 – Nineteen months after the unpunished murder of Berta Cáceres, we, the Mesoamerican Women Human Rights Defenders Initiative (IM-Defensoras) – representing more than 800 defenders in El Salvador, Guatemala, Honduras, Mexico and Nicaragua – the National Women Human Rights Defenders Network in Honduras, and the 179 signed organizations, express our concern over the grave situation of repression and criminalization faced by social movements, human rights organizations and, particularly, women human rights defenders. The events that took place on September 8, 2017 exemplify our collective concern. Honduran security forces violently repressed and arrested 16 members of the University Student Movement peacefully protesting on the National Autonomous University of Honduras (UNAH) campus, and then attacked human rights defenders who were observing and documenting the situation. Police then intercepted a bus, provided by the National Commissioner of Human Rights (CONADH), and using a tow truck rocked it back and forth, while spraying teargas inside the bus. Those inside the bus included Hedme Castro, Director of the Association for a Participatory Citizenry (Aci-Participa) and Tommy Morales, a communicator and member of the Association for Democracy and Human Rights in Honduras and the National Women Human Rights Defenders Network in Honduras. Both women human rights defenders were hospitalized and Tommy Morales now faces criminal charges. Direct attacks against human rights defenders represents the closure of civil society space, regression to authoritarian practices, and flagrant non-compliance with international human rights treaties signed by the government of Honduras. Such attacks are aimed at obstructing and deterring social protest and the work of defending human rights, and are paving the way for new and more serious acts of repression. It is important to note that this latest attack is not an isolated incident, but instead, signifies an ongoing increase of violence and repression against women human rights defenders in Honduras, which leaves citizens extremely vulnerable. 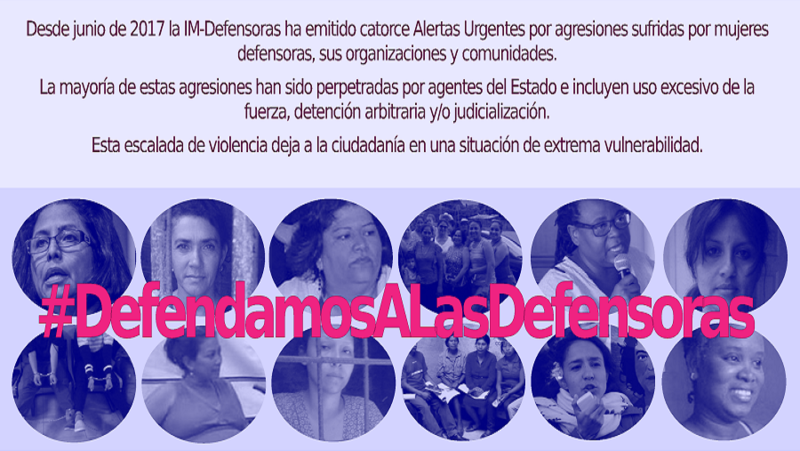 In a three month period since June 2017, IM-Defensoras has issued 14 Urgent Action Alerts about attacks suffered by women defenders, their organizations, and their communities. State agents have perpetrated most of these attacks – concretely, security forces – and the majority involve excessive use of force, arbitrary arrests, and/or judicial prosecution. In the cases in which the aggressors were not State agents, the corresponding authorities did absolutely nothing to guarantee security and access to justice to the women defenders affected, despite their obligation to enforce the Law for the Protection of Human Rights Defenders, Journalists, Social Communicators and Administrators of Justice. Of special concern are the attacks against women defenders who have faced repeated attacks, such as Miriam Miranda (Coordinator) and Madeline Martina David of OFRANEH. It is important to note that Berta Cáceres’ assassination was preceded by a series of attacks similar in profile or pattern from those faced by Miriam Miranda, who despite having received international recognition, continues to be targeted in an attempt to restrict her work as a human rights defender. The outlook is concerning. In spite of repeated calls by the international community to respect human rights in Honduras, a policy of systematic persecution and repression against social movements and human rights defenders triggered after the 2009 coup d’état persist. This same policy has often placed public security and justice institutions at the service of large landholders and national or transnational private businesses to protect their economic interests at the expense of the collective and individual rights of the Honduran people. For women human rights defenders, the prospect is of even greater concern. Discrimination and gender violence pose additional risks for women activists, who are playing an increasingly greater and more visible role within different social movements or on the frontlines of struggles to defend land and territory. Women defenders work in a context of misogyny and gender discrimination as seen by increasing femicide rates and cases of violence against women, and in public policies that restrict a woman’s right to make decisions about her own body and sexuality. Between 2012 and 2016, IM-Defensoras has documented 1,128 attacks and 13 assassinations of women human rights defenders in Honduras. In this situation, IM-Defensoras, the National Women Human Rights Defenders Network in Honduras and the signed coalitions and organizations, call on the general public and international human rights organizations to remain vigilant and continue placing a spotlight on the situation in Honduras, while demanding that the State comply with its obligation to guarantee the right to defend human rights and to assure the security of those who do so. provide the conditions necessary for women’s political participation and contributions to justice and equality.